03/02/08 W83. (W78) Stemmed knife, 4 3/8", MN quartzite, other side much nicer, $39. 03/02/08 W84. (W79) Smithsonia, 2 5/8", TN, tan material, nice example, $29. 03/02/08 W85. 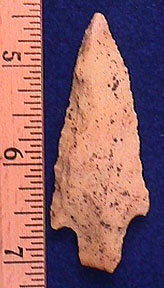 (W80) Hopewell, 2 3/16", IN, hornstone, fine edge work, from my collection, $30. 11/14/07 W86. 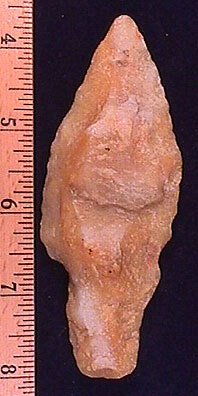 (W82) Adena, 2 7/8", KY, Boyle chert, ground stem, $20. 11/14/07 W87. 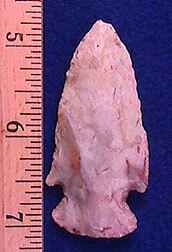 (W83) Hopewell, 2 3/8", MO, glossy heat-treated Burlington, small tip ding, $39. 08/09/07 W88. 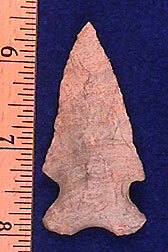 (W85) Castroville, 2 1/8", TX, mottled grays, ex-Ken Partain, very thin and well made, right ear appears to have been worked/not broken, $45. PRICE REDUCED TO $29. 08/09/07 W89. 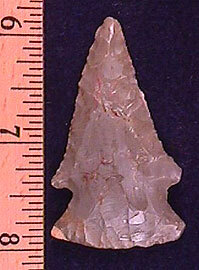 (W86) Marshall point, 1 3/4", AR/TX, Crowley's Ridge chert, ex-Ken Partain, pretty color with fine workmanship, $39. PRICE REDUCED TO $29. 08/09/07 W90. (W87.) 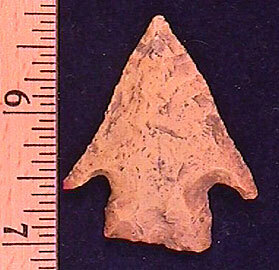 Adena-Robbins, 3 1/8", Northeast MS, Ft. Payne(? 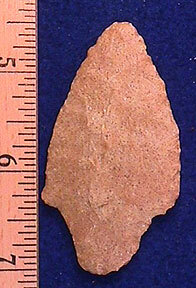 ), thin and very well made, use wear on blade edge, $25. PRICE REDUCED TO $19. 08/09/07 W91. 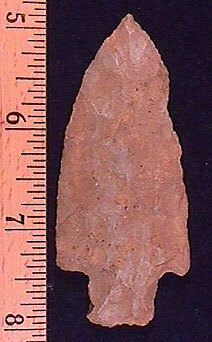 (W88) Big Creek, 2 3/16", AR, Burlington chert, ex-Ken Partain, $15. PRICE REDUCED TO $10. 08/09/07 W92. 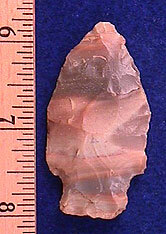 (W89) Fractured base point, 2 3/8", TN, glossy Buffalo River chert, symmetrical and well made, $10. PRICE REDUCED TO $8. 01/28/07 W93. 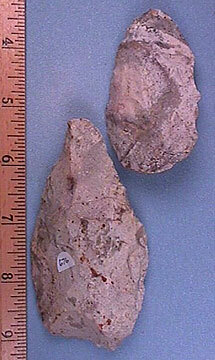 (W90) Set of 2 Woodland preform/tool, 2 3/4" and 3 15/16", MO, Burlington chert, $10. PRICE REDUCED TO $6. 08/01/06 W94. 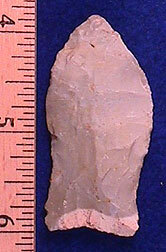 (W91) Adena, 2 9/16", KY, quartzite, very thin and well made, I like this piece, $29. PRICE REDUCED TO $20. 08/01/06 W95. 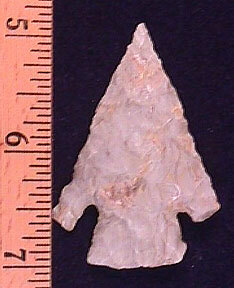 (W92) Copena, 2 3/16", TN, hornstone, ex-Ken Partain, thin, $25. PRICE REDUCED TO $19. 09/09/04 W96. 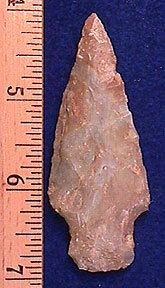 (W94) SOLD Adena-Robbins, 2 1/4", KY, Carter Cave, thin and pretty, $29. PRICE REDUCED TO $19. 09/09/04 W97. 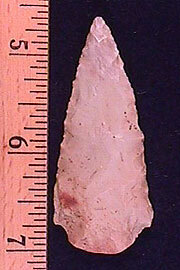 (W95) Hopewell point, 2 7/16", Logan Co., AR, banded pink and tan, ex-Ken Partain, well made with a needle tip, $39. PRICE REDUCED TO $29. 05/18/04 W98. 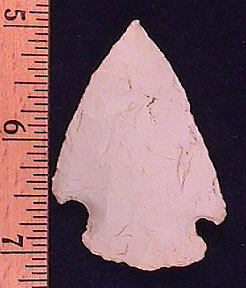 (W96) Adena, 3 1/8", Southern IN, hornstone, super base, $29. PRICE REDUCED TO $19. 12/03/03 W99. (W98) HOLD Copena, 2 3/16", TN, Ft. Payne with a heavy river stain, resharpened at least once while hafted, $25. PRICE REDUCED TO $19. 09/06/03 W100. 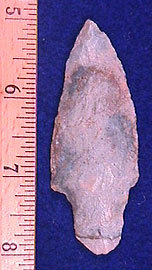 (W94) (W70) Adena, 3", KY, mottled blue and gray, pretty, $25. PRICE REDUCED TO $19.